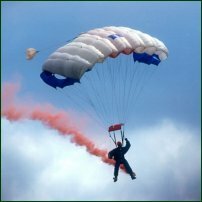 How to Survive Falling Out of a Plane: "Let us imagine that you are on a long distance flight and you decide to answer the call of nature. Misunderstanding the stewardess, you open the wrong door1 and now find yourself falling from 30,000 feet, the average cruising height for civil airliners. What are you going to do?"